China Town, a great place for complimentary tea tastings, massages, and shopping bazaar style goods. 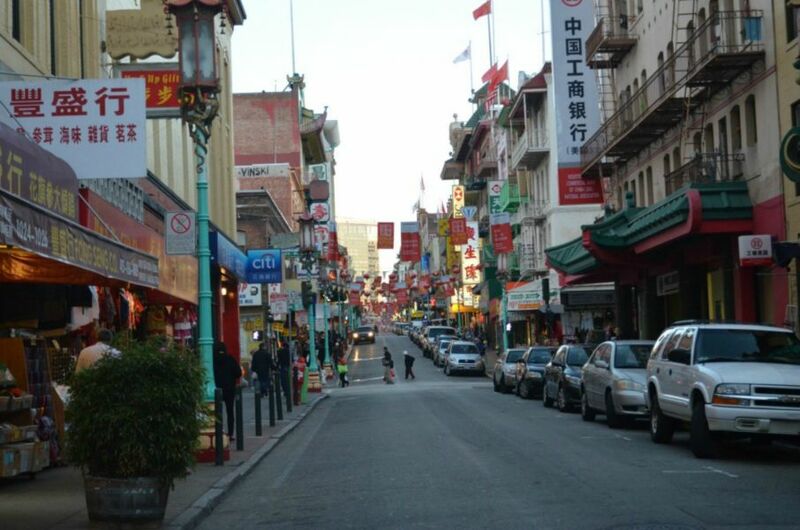 Local Taste of The City tours offers a experience to eat through Little Italy/North Beach or Chinatown. Try the best cuisines and get the best info from a SF local. Bluestem Brasserie is a great restaurant for groups offering a upscale, yet comfortable atmosphere and seasonal dishes. Feel like a diva at Hotel Diva, a boutique hotel located in Union Square fit for a king and of course, a diva. Beach Blanket Babylon is one of the longest music revues in history and is a must when in SF. On top of the many hills of SF lies the greatest views, as well, the best hills for a good hike! Clarion Alley (via The Mission) is a must-see for art or graffiti enthusiasts. Electric Tour Company offers a segway tour through Golden Gate Park - which is highly recommended experience if you love nature. Urban Tavern located at the Hilton Hotel SF Union Square offers a great menu, fresh ingredients and a great restaurant for groups. John's Grill, located near shopping and theatre's in Union Square. Hornblower Cruises offers dinner and brunch cruises - get on board to experience for three hours dining, dancing and the best view of SF. The view of The Golden Gate Bridge from the Horn Blower dinenr cruise. Castro, a vibrant community - with great bars, cafes and nightlife - located near the Castro Theatre. Cookies Rule Everything Around Me, (C.R.E.A.M) located in the Mission is great spot for ice cream or if you crave something delicious and sweet. View rare flowers and tropical plants via The San Francisco Conservatory of Flowers . The Restaurant Collection at the Westfield Centre Mall located in San Francisco, California. Tap 415 located inside the Westfield Centre Mall in Union Square. When in SF the famous cable cars are a must. Each way is $6 each - or save with City Pass. Fog Harbor Fish House is great for seafood - and dessert. Located near Pier 39/Fisherman's Wharf. Pier 39 (near Fisherman's Wharf) is a great place for shopping and SF souvenirs. San Francisco is one of the top tourism destinations in the world for many reasons. A few hours away from other notable destinations, such as Los Angeles, Oakland, and the famous Napa Valley, San Francisco has plenty to do and is a convenient hub to access other great cities. AXS explored the city for 72 hours to bring you a detailed guide on the best offerings from the city by the bay. San Francisco is known for the famous cable cars and has many convenient methods of transportation, but, is a walkable and bike-friendly city. A common misconception one assumes is that a destination is farther from where it’s located. Half of the time, the destination is closer than one would expect. If you're driving to San Francisco and wish to take in the best of the city; we recommend the infamous 49-mile scenic drive. Coit Tower. Coit Tower, also known as, Lillian Coit Memorial Tower, is a 210-foot tower in the Telegraph Hill. The Alcatraz. Offshore a few miles from San Francisco is this small island that was home to America's most dangerous felons during 1934 to 1963. The Golden Gate Bridge. Heralded as one of the top ten construction achievements of the 20th Century and must-see in San Francisco. Lombard Street. Walk this way, but be careful - on San Francisco's infamous crooked, curvy Lombard Street. Golden Gate Park. San Francisco's greatest treasures with over 1,017 acres of land with museums, trails, playgrounds, gardens and more. The Mission District. A gentrified Latin district comprising of unique shops, restaurants and street art. Union Square. The center of it all is Union Square, a busy hub great for shopping, dining, entertainment and more. Fisherman's Wharf/Pier 39. To find some of the unique souvenirs in San Francisco, see the most captivating views, and with more than 100 stores, live entertainment, to even art galleries visit Pier 39. City Pass is a great way to sight see and save money in San Francisco. The City Pass includes a 7-day pass for unlimited cable cars and SF muni rides, 1-hour bay cruise, access to many tourist destinations and more! The value of the pass is estimated in over $70 in savings. If you love shopping, then you'll love shopping in San Francisco. The city has over fifteen distinctive shopping areas offering a variety of shopping experiences for every budget! Shop vintage, thrift and fabrics on Mission Street. Snag fifth avenue favorites on Fillmore Street or shop like a local from the farmers market at the Ferry Building. Union Square is your best bet for shopping in San Francisco. You’ll find everything you need via a variety of shops from high-end, independent and local retailers, and many other gems. Westfield Centre Mall, in Union Square, holds over 200 stores, many independent eating options, a co-working space and movie cinema. If you’re traveling to San Francisco for the first time, the mall offers tourism perks, such as the Passport To Savings booklet. This booklet provides visitors with hundreds of savings and perks from San Francisco's best shops and restaurants. Dining At The Westfield Centre. The best thing about Westfield Centre, many of the restaurants are independent - which means you find them anywhere else, except SF. When at the Westfield Centre Mall, if you go to the last level of the mall, known as, “the dome”, dine at a collection of distinctive restaurants; all suitable for casual dining. TAP 415. Located inside the Westfield Centre Mall, this dining experiences offers American cuisine with a twist. After (or during) shopping at Westfield, grab a delicious tap burger or a glass wine or beer. Tap 415 is perfect for groups and suitable for large groups and family friendly. A local favorite: the Tap Burger and pretzel nuggets. If you’re seeking a casual dining experience with a notch of upscale, we have three different options for you. There are endless possibilities while dining on the various piers of San Francisco. ($=$30 - $60 ; $$ = $80 - $150 ; $$$ = $150+). Hotel Diva. Hotel Diva is a boutique hotel offering a comfortable stay with style. This boutique hotel is stylish, pet-friendly, personable, and minutes away from Union Square’s greatest shops, attractions, and public transportation. Hilton Hotels. If you prefer a trusted hotel chain, look no further than the Hilton SF Union Square near Chinatown, Nob Hill, and transportation. The hotel offers convenience with many activities, amenities and experiences on the site, including Urban Tavern, a stylish lounge, coffee shop, fitness center, an outdoor pool and hot tub. There are also many other Hilton owned hotel properties located around San Francisco. Visiting San Francisco for the first time? A guided tour is highly recommended; San Francisco has many tours depending on your tastes from guided Segway, historic, and even food tours. If you explore the city solo, experience over 20 neighborhoods, each having their own unique aesthetic. In addition, enjoy various dive bars, the indie music scene, various events, and the eclectic nightlife if clubbing is your thing. Beach Blanket Babylon. If you’re a pop culture or broadway junkie, the longest musical revue in American history, Steve Silver’s Beach Blanket Babylon is a must-see! From the music, hilarious cast and outrageous, yet stunning costumes. When visiting San Francisco, do not leave until you’ve seen this show. If you fancy witty murals, paintings and picturesque street art, Clarion Alley (in the Mission District), is a must. San Francisco is known for the best views of the Pacific Ocean, San Francisco Bay, and SF overall. To get the ultimate best views, we recommend the various (and steep) hills of SF. There're 43 hills, the most popular include Twin Peaks, Nob, Russian, and Telegraph. San Francisco is home to one of the first gay neighborhoods in the United States, Castro. Castro is a vibrant community with rainbow-hued streets, many great bars, cafes, and wild nightlife. San Francisco is an eclectic city, offering a memorable experience for all. San Francisco will host the 2016 Super Bowl, is home to one of the best airports in the United States and has a booming startup scene. Start your planning your San Francisco itinerary, right here! Are you spending 72 Hours somewhere? Share your own travel highlights via social media using hashtag #72HoursIn. About AXS '72 Hours In': a travel series aimed to inspire you to travel more. This year is a big year in travel and you don't need a more than a week, a month or even have to leave your country. By spending just three days in a destination, which can be located three hours to three thousand miles away, you're sure to discover something new.